After going into preterm labor and experiencing the hospital from a different perspective, I really became aware of how grateful I was for good nurses. My main nurse was incredible. She allowed me to make decisions regarding me and my unborn baby's health, unlike the triage nurse who acted as if I didn't have options or a say when it came to what treatment and actions they needed to take. I had already planned on making thank-you gifts for the nurses who would take care of and assist me during and after labor, but this earlier experience really sealed the deal, and I got creating soon after getting released and coming home. I was on bed rest, but this was something I could work on from the comfort of my bed. It also helped take my mind off all the millions of other preparations I wasn't able to do, like set up a nursery. I convinced my husband, who was adamant about my resting, that I was well enough to go with him to pick out the items from the store. 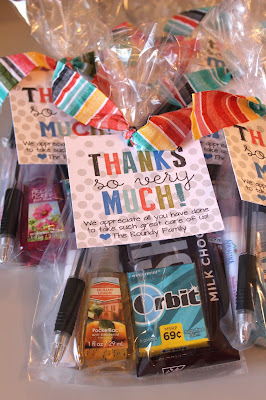 I also designed a little thank-you tag to tie around each bag. I used the bottom color options since we were having a boy, and tied them on with some colorful fabric scraps. I created the tags in two colors, with and without a message attached. Lucky for you, I making all four options available for download, so that you too can say thank-you to those who don't get as much praise- the nurses, midwives, doulas, and even family and friends. They are the ones there with you more time than the highly paid doctors :) and I think they deserve some thanks! To download click on the option you want to be redirected to the download page. I found this six years too late! I was in the hospital for 7wks before my mono-mono twins were born at 32 weeks (and 1 week after). 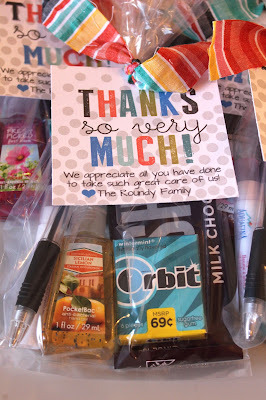 I wish I would have thought to make special little thank you gifts (I did write my sentiments, though). I might have to work on this to send to the nurses when my twins turn 7! these are the cutest! Thank you so much for the printable :) The nurses will love it!! !